Dr. Frank ’82 and Lisa Kolisek will be the first ones to tell you: they feel like they just finished paying tuition at Wabash. Their two sons, Jake ’11 and Charlie ’14, are recent graduates, not to mention their daughter Kelsey who is a ’16 graduate from Denison. And yet in addition to a five-figure annual leadership gift to the Annual Fund for the duration of the campaign, they have also just committed an unrestricted estate gift of $1 million to the College as part of the Giant Steps campaign. As members of the Campaign’s Executive Cabinet, Frank and Lisa have seen the energy firsthand at Red-Letter events around the country in support of the Giant Steps campaign. 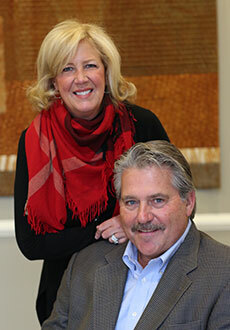 Frank is a member of the Board of Trustees and chairs the Admissions and Marketing committee. He is an Indianapolis-based and internationally-recognized total joint surgeon with OrthoIndy who specializes in the treatment of hip and knee arthritis. Lisa is a registered nurse who retired after the birth of their second child. She has served on various community and educational boards. Frank and Lisa feel the campaign is the perfect opportunity to secure Wabash’s future as it heads into its bicentennial. For more information, including the College’s progress to date and ways to give, visit the Giant Steps website.